"The lights turned on, I looked into the ball of bundled sweater that I had but nothing was there. I looked behind me on the seat and then I saw movement and there was a scorpion that was in the fold toward the back of the chair." "There was a scorpion in my sweater. 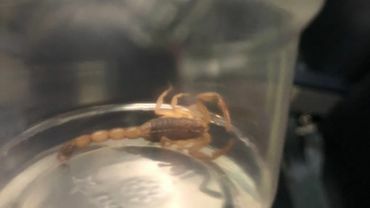 It was on my back for the past 30 minutes … it was like four inches [about 10 cm], maybe," she said, adding that she wondered "what is that doing on a Canadian flight." terrible story thanks for sharing. Double Yikes.Hate to see one of those on my flight.